Infertility. Stem-cell research. Genetic testing. Withdrawing life support. Cremation. A new book, co-authored by Redemptorist Father Kevin O’Neil explores the Catholic responses to these and several other medical issues that people wrestle with in the 21st century. 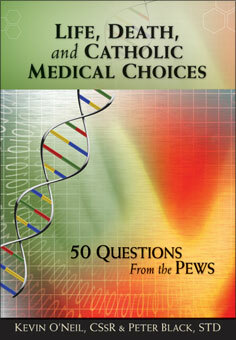 In Life, Death and Catholic Medical Choices, Father O’Neil and his co-author, Father Peter Black, use a question-and-answer format to provide guidance on 50 common "questions from the pews." Their theme is how to make informed decisions which draw upon our Catholic tradition and so respect our human dignity and the dignity of others. The book is published by Liguori Publications. Click here to listen to an interview with Father O’Neil about the book. Father O’Neil is an associate professor of moral theology at Washington Theological Union in Washington, D.C. He professed vows as a Redemptorist in 1975 and was ordained to the priesthood in 1981. He also co-authored, with Father Black, The Essential Moral Handbook: A Guide to Catholic Living (Liguori Publications).